Order Samples Online. It’s Easy and Free. 1. Order FREE samples (except for any type of stones, up to 2pcs). Each tile sample is 10cm by 10cm. 2. Samples ship straight to your door so you can test the quality of our products from the comfort of your own home. 3. Ordering tile samples works very much like on-line shopping cart system. Simply browse the on-line catalogue and find the tiles you like. 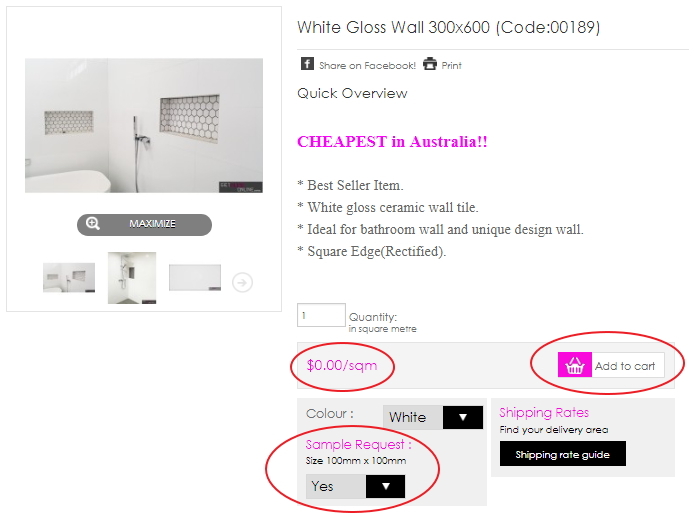 Once you have selected the tile that you want to get a sample of, simply change the Sample request to 'YES' and then click “Add to Cart”. 4. Postage on all samples inside Sydney Metro - only $10 up to 2 samples. Postage on all samples outside of Sydney Metro - only $15 up to 2 samples. 5. For larger projects please contact us directly to discuss your sample requirements.